“Originally, 125 years ago, it was on the other side of the square. And then it moved to this side of the square but down where City Hall is at 538 Wabash. And we were there for many, many years,” said Amy Gee, Director of the Carthage Public Library. 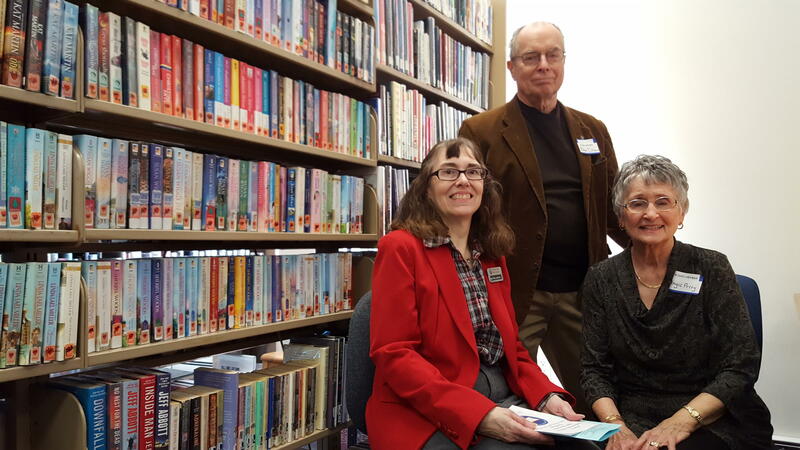 Gee spoke to Tri States Public Radio during the library’s 125th Anniversary Open House on Sunday, March 10, 2019. The event featured displays of the library’s history, tours of the building, and live music by Hancock County-based band The Lemmings. Planning for a public library in Carthage began in March, 1893 and the library opened to the public on March 10, 1894. The library’s current building had been used by Marine Bank, which announced in January, 2004 that it would give the building to the library. That allowed the library to move out of City Hall, giving the city more space for its staff and operations. Now, the library district hopes to find a new home. Library Board President John Dittmer pointed out the current facility was not built to be a library. “It’s very crowded as you can see with the books and everything. And then whenever we have a lot of people in here, it’s hard to manage. So we need more space for kids’ programs, adult programs. We just need some more space,” he said. Dittmer said the library board spent the last few years studying the possibility of getting a new library building. He says it’s a top priority for the board but finances will determine whether it can be done. “We plan to continue to serve the public as long as we can and as best we can. And we’ll keep looking for an improvement in our facility and our setting,” Dittmer said. Gee said no matter where the library is located, it’s a valuable resource, even in an age when so much information is available at one’s fingertips. Gee said thousands of visitors check out items such as books and DVDs, people can download e-books and audio books through the library’s website, and the library hosts programs for people of all ages. Angie Perry, who’s served on the library board for 42 years, said the library offers many programs and books for children. Macomb aldermen are contemplating whether to end the city's relationship with the Macomb Area Convention and Visitors Bureau and instead have the duties handled by City Hall. It's an issue worth watching because of the economic impact of tourism.